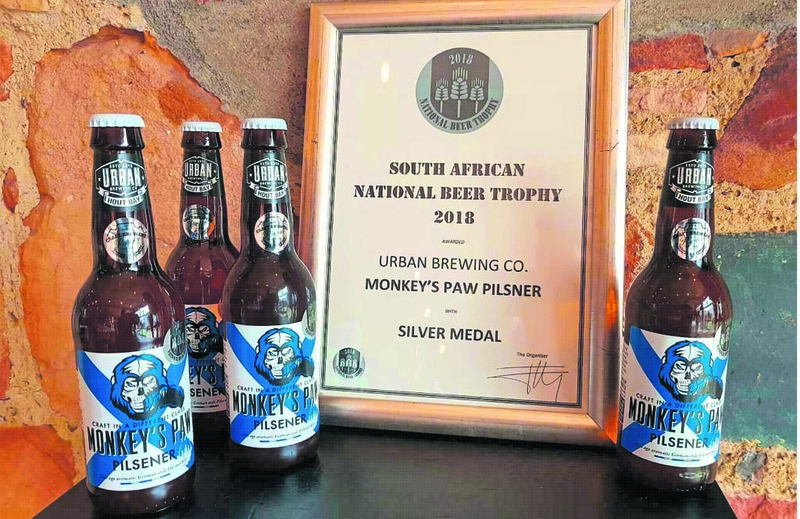 “This is testimony of stringent quality control measures and our consumer can thus expect to enjoy this fabulous beer over and over again without any unpleasant surprises,” says Jorg Findkeldey, master brewer at Urban Brewing Co in Hout Bay. The brewery won a silver medal at the South African National Beer Trophy (SANBT) awards held in Cape Town last month. They won the award for their Monkey’s Paw pilsner for the second time in two years. The 2018 SANBT reportedly had 212 entries and over 25 judges. Findkeldey says the secret to the beer is the unique noble hops and unchlorinated fresh mountain water used for this brew, and waiting for at least eight weeks of maturation and layering before releasing it. He says the award means their beer is recognised as being of exceptional standard and outstanding quality. He attributes their success to good relations between the team and the owners of the brewery. He says craft beer is different to mainstream beer as it requires more hard work. Findkeldey says beyond just running a business, the brewery also gets involved in creating opportunities for the community of Hout Bay.